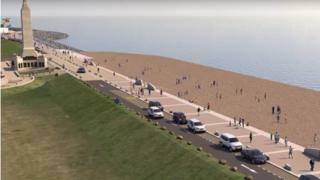 Revised plans for new sea defences in Southsea have been released. The £114.5m project to renew the ageing defences between Old Portsmouth and Eastney was remodelled after feedback from Portsmouth residents. Portsmouth City Council has released a video showing the updated plans which are expected to protect more than 8,700 properties from flooding. It said the current defences on the 2.8-mile (4.5km) stretch of seafront were likely to fail within 10 years. Some of them are 100 years old and temporary repairs have been made to plug holes and shore up several collapses in sections of the sea wall. The authority said that after more than 1,400 members of the public had their say in a survey launched last summer, designs for many of the eight sections of coastline were adapted accordingly. One main area of contention, according to the Local Democracy Reporting Service, was South Parade Pier where locals were concerned about the retention of sea views along the pavement. In revised proposals the rocks are buried underneath the shingle and defence heights are reduced. At Canoe Lake the road will remain a two-way route with parking, and at Southsea Common, where residents asked to keep the road, the new plans outline a one-way system that retains parking spaces. If funding is secured and the design finalised, construction could start in early 2020, the council said. The project will be completed in phases and the council hopes to have it finished by 2026.